yo @AndrewWK are you really gonna let a neo-nazi Oi show go down at Santos party house? The Oi! skinhead scene don’t have the easiest time finding venues for their bands to play. They have an equally hard time not getting their shows cancelled thanks to the efforts of anti-fascist activists Antifa. For that reason, venue names are often kept off flyers and the internet in general. Bushwick venue the Acheron apologized after hosting an Oxblood/Offensive Weapon show there in 2013. This time it’s Williamsburg’s Black Bear Bar doing the apologizing. Black Bear Bar is the Brooklyn bar in the old Public Assembly/Galapagos space on North 6th in Williamsburg, and that’s where NYC Oi! 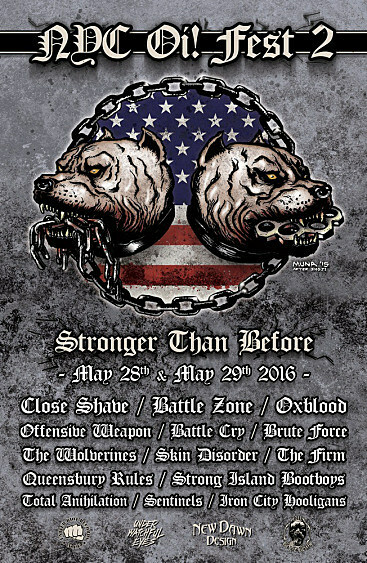 Fest 2 was taking place over Memorial Day Weekend (May 28 and 29). Oxblood, Offensive Weapon, Battle Zone, Close Shave, and at least 10 other band were on the bill which then moved to Santos Party House last minute after pressure from protesters led Black Bear Bar to cancel the event in progress. Tonight show oi,s show/fest have been cancelled! Santos, where the show did go on, meanwhile has not apologized or officially announced that the Oi Fest may have been their LAST SHOW EVER. According to multiple posts on social media, this may not have been Santos’ first Oi! show. It’s hard to tell exactly where NYC Oi! Fest 2015 took place, but it looks like at least half of it took place at the Paper Box. That all said, it’s doubtful that most if not all of the Santos owners, Andrew WK and rapper Despot included (there are a bunch), knew anything about the booking. The two musicians did receive a lot of slack on social media over the past day though. Today on the Internet: I'm a Neo nazi. @newyorkyearzero had nothing to do with the booking. I'm Jewish. My middle name is Israel. Go yell at someone else. To make matters worse, another show was actually cancelled last minute to make room for Oi! Fest. BONUS: There’s a video from the fest of Offensive Weapon covering Youth Defense League, complete with a shout-out to recent blog star “English Nick“.